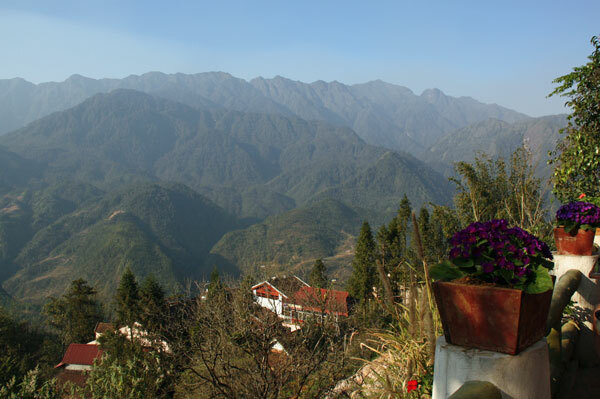 To be perfectly honest, I’d only vaguely ever heard of Sapa before I arrived in Vietnam, and I had no plans of visiting the mountain resort. It turns out I’m closely following the “tourist trail” since most people fly into Hanoi and then take side trips to Sapa and Halong Bay before heading south, and that’s exactly what I’m doing. When I first arrived in Hanoi it was hot (in the high 80s) and really humid, so the weather combined with the general insanity of the place made this “colonial French mountain station” called Sapa sound extra nice. My arrival in Hanoi was a little over a week before Tet (lunar new year) begins, and the pace of the place is a bit hard to take, especially right off the plane from Portland. To give you an idea of what Hanoi before Tet is like, imagine you are living in a storefront in Times Square with people racing by at all hours. Now imagine that you don’t understand what a single one of them are saying or doing, and that still about 10% of them are constantly calling out to you to hire a motorbike taxi, or buy some used books, or a Vietnamese army hat. As nice as Hanoi is, it was a little overwhelming, especially at first. So I booked a night train in a sleeper car for US$25, and this was in a so-called private car that is nicer than the state-owned carriages that cost a bit less. The train left Hanoi at around 9pm and arrived in Lao Cai around 6am the following morning. 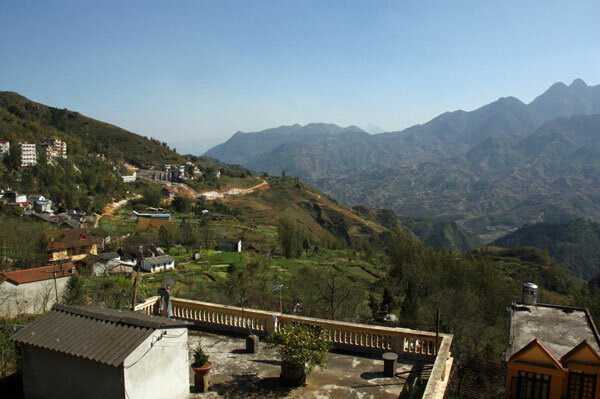 Lao Cai is on the Chinese border and it’s at the base of the eastern Himalayan mountain where Sapa is located. The hotel in Sapa I’d reserved a room at had a van waiting for me and a handful of other passengers there at the station, so after about an hour driving up the mountain we arrived. The main draws of Sapa, as far as I can tell, are the mild mountain weather (Hanoi is steamy most of the year), the wonderful scenery, and the small craft villages that surround the town. I had a very pleasant 2.5 days in Sapa, but I have mixed feelings about two of those three things. The town is nestled in between these sharp and forested peaks, so the views really are wonderful in pretty much every direction. The downside is that the area is famous for its hazy weather, which is pretty much always present, except when it’s completely fogged in. It was really nice to see in person but I didn’t really think it would translate into photos all that well, especially by an amateur photographer such as myself. Scanning my photos I’m actually pleasantly surprised by how well many of them turned out. This is my new DSLR but I don’t know how much that had to do with it. Here’s where things went a bit sour for me. Hanoi, as I described above, is so frantic that I was really looking forward to spending a bit of time in a place where thousands of people weren’t constantly scrambling around. Be careful what you wish for, because in Sapa, which has a population of around 25,000, I think, it felt like every single person in town was either a tourist, like myself, or someone trying to sell crafts to tourists. I’m not exaggerating when I say that at any given moment on the street the number of salespeople to tourists was about 5 to 1. Without anything else going on in the town (quite a few businesses were closed in preparation of Tet), I’d walk out the front door of my hotel and a group of traditionally dressed mountain women would race over toward me, shoving embroidered pillowcases and wallets in my face. They are relentless, and since there were so few tourists in town at the moment, I couldn’t really blame them for being aggressive like that. Them: You buy from me? That exact exchange took place about once every minute as long as I walked around the city. And that is exactly why I mostly stayed in my hotel during most of my visit. I’ve encountered this sort of thing in many places on my travels before, and it seems that many tourists are too polite to say they won’t buy “later” so the merchant uses that as leverage the next time they meet, which will be sooner than the tourist usually thinks. This sort of thing is sadly common, where the financial divide between locals and tourists is so great that the locals pretty much scare off tourists. Again, I can’t really blame most of them, but it does cast a bit of a shadow over visiting places like this. My normal rule when living out of a backpack for an extended period of time is that I don’t buy anything, ever. If I were only here for two weeks I’d actually buy quite a few trinkets from these people, but I don’t want to carry a small carved aluminum box with me for months just because it only cost US$2. I did actually buy one thing though. For around US$2.50 I’m now the proud owner of this local Jew’s harp-like thing that sounds exactly like the opening bars of the Globe Trekker (formerly Lonely Planet) theme song. It comes in a decorative tube that is about the size and shape of a fancy pen. 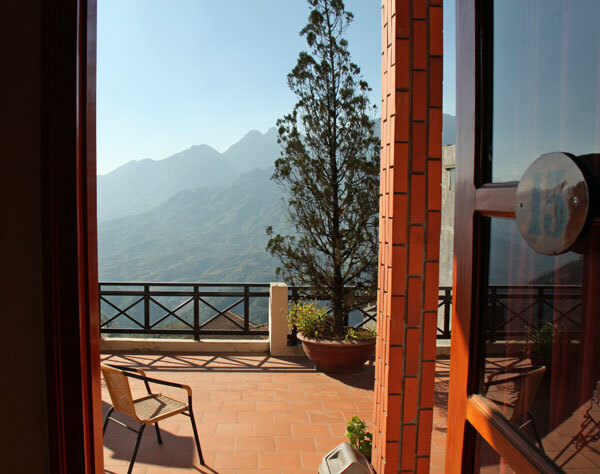 The best part of my stay in Sapa was the Cat Cat View Hotel where I was staying. My room was US$20 per night, and even though parts of it were a little rough around the edges, it would probably cost $300 per night if it were in the mountains of Hawaii. A huge common balcony was just in front of my room, and the wonderful scenery surrounded it in every direction. A surprisingly good restaurant/bar was just a staircase away (my room was on the 7th floor and it was on the 8th floor), and there you could get good and cheap food and drinks pretty much all hours of the day. I ate there many times and enjoyed the views from the privacy of this resort-like hotel. Most of the sights in the area were to be arranged as part of organized tours, as I found out, and they seem to be set up for private parties, so as a solo traveler I’d have to pay for the whole thing myself and go alone (with the guide). I skipped those and instead I did the one thing that is walkable from Sapa, which is a stroll to nearby Cat Cat Village. 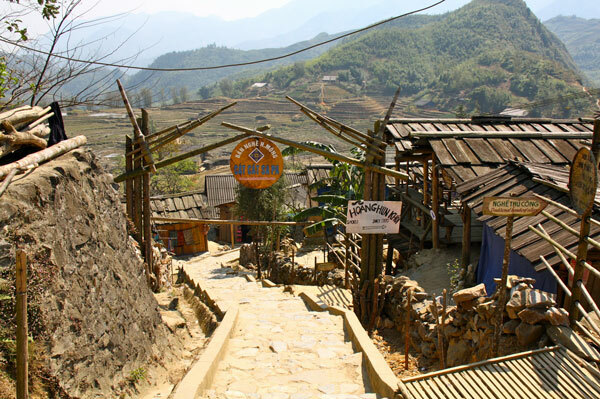 Once I set out on the road out of Sapa that goes to Cat Cat, I was immediately badgered by (xe om) motorbike taxi drivers who wanted to take me down the hill. I heard that it was only about 1.5 miles, and it was downhill, so I refused. But one in particular, who called himself Nokia and had that name scrolled on his helmet, just kept following me. I eventually told him I might be interested in a ride back up. Walking down this steep mountain was pleasant enough. I had to pay an entry fee of about one dollar, and then a bit farther down the road you switch from a steep road to an even steeper set of staircases. Long story short, it’s like walking about 1,000 feet in elevation down a mountain, and then walking down about 50 (no joke) flights of stairs, except the stairs are uneven, jagged, and have no hand rails. Continuing down the stairs I would occasionally pass a crude house-like structure built along the side, and inside about half of them was someone wanting to sell me craft items. I kept going and going, and when I finally reached a small and unspectacular waterfall and a few “shops” at the bottom I realized that this was the so-called village. It was interesting to see, but I can’t say I’d recommend it to anyone, especially considering it’s so steep and a bit dangerous as well, and that’s in good weather. Once I finally got back to the road portion of the loop, which is back up a steep path and quite a few more staircases, I saw Nokia the xe on driver waiting for me, just as I expected. The weather was sunny and around 70F so it might have been a pleasant walk back up, but this is in the mountains and the thinner air already had me gasping a bit once I started back up, so I ask Nokia how much for a ride back up. He said 100,000 dong (about $5) and I began walking away, so we quickly settled on 50,000 dong, and I had my first (and so far only) motorbike ride here in Vietnam. It was well worth it. The distance is no problem but with the elevation my heart probably would have exploded about halfway up, so $2.50 was a fair price to avoid that and return to my hotel looking fresh as a spring morning instead of covered in sweat and barely able to move. 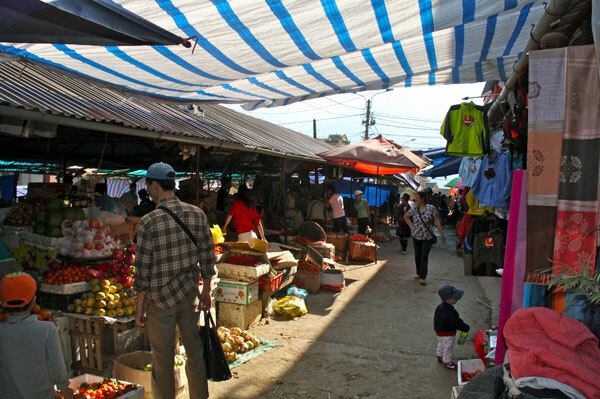 As I hinted at above, there isn’t much to the town of Sapa itself, except for a very busy public market, where locals trade food of all kinds plus general household items in the town square. I’ve seen similar markets dozens of times before, and while they do make for good photographs, the problem is that it’s a bit rude to take a snapshot of a poor merchant and then just walk away without buying anything. I took very few photos as a result. And so, about 60 hours after I arrived, I was back at Lao Cai waiting for the train back to Hanoi. It was a pleasant few days, marked by especially nice weather, and it was very cheap as well so I am glad I did it. 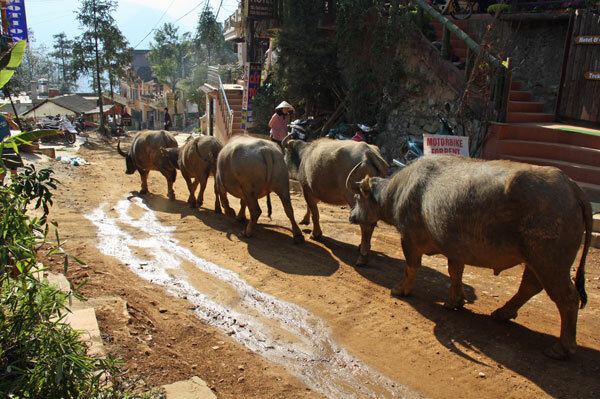 But otherwise I think a person can come to this region and skip Sapa without feeling too cheated about it.